Two people were critically injured after a tanker truck overturned and caught fire on Interstate 95. Traffic remained snarled Thursday evening in the area of I-95 and Woodhaven Road in Bensalem Township as road repairs continued after an earlier tanker-truck accident and fire that left two people critically injured. The ramp from eastbound Woodhaven to I-95 was expected to reopen sometime Thursday night, PennDot said, while more extensive repairs were needed to the off-ramp from northbound I-95 to Woodhaven. Those were expected to be completed by Friday evening, PennDot said. The crash occurred on that northbound ramp about 10:15 a.m. Due to the crash’s location, it took firefighters more than hour to establish a water supply to battle the inferno, which spread to woods bordering the ramp. Medics transported the tanker truck’s driver and a passenger to a hospital in critical condition, police said. No other information was immediately available. 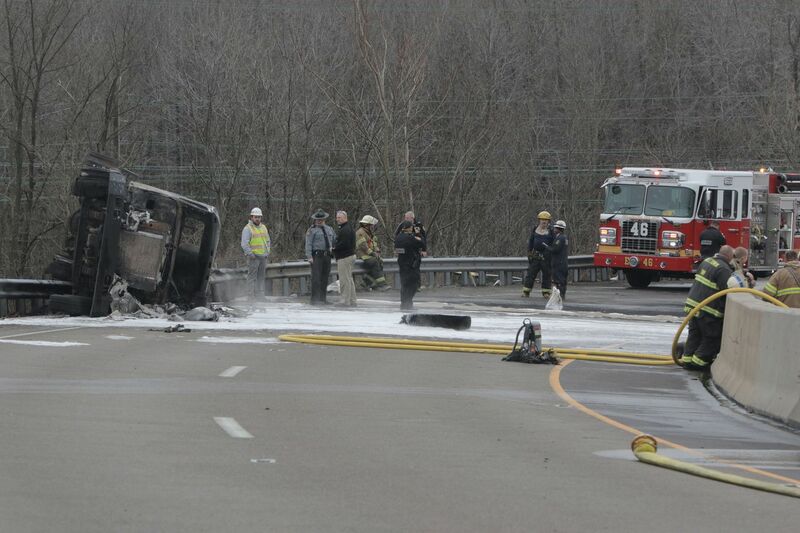 An overturned tanker caught fire on Interstate 95 on Thursday. With no hydrants nearby, firefighters brought in a water tanker and stretched hundreds of feet of hose through a parking lot at SEPTA’s nearby Cornwells Heights train station before getting water on the fire about 11:30 a.m. and quickly dampening the flames. The ramps linking northbound I-95 and Woodhaven Road remained closed throughout the day. The cause of the crash and fire are under investigation, including by fire marshals from the Philadelphia Fire Department. A PennDOT traffic camera shows the tanker on fire on a ramp linking Woodhaven Avenue and I-95 in Bensalem.